Business Today gives you a quick recap of what made news recently. 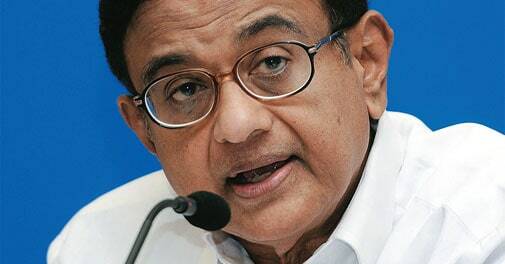 As the UPA-II regime comes to a close, finance minister P. Chidambaram is keen to project its achievements. The current account deficit in India is likely to be $35 billion in the current fiscal year, he said - lower than about $88 billion recorded in the previous fiscal year. >> The fiscal deficit in the first eleven months of FY 2013/14 touched Rs 5.99 lakh crore, or 114.3 per cent of the full-year target. The deficit was 97.4 per cent during the period from April to February a year ago. The government revised the full-year target to Rs 5.25 lakh crore, or 4.6 per cent of gross domestic product, from Rs 5.42 lakh crore, or 4.8 per cent earlier. >> A group of fuel retailers in Delhi has come up with a unique offer to encourage voting: a discount of 50 paise per litre on petrol for customers with the indelible ink mark on their fingers that indicates they voted. >> Indian manufacturing activity grew at a slower pace in March, as weaker domestic demand dragged on output growth. The HSBC manufacturing purchasing managers' index (PMI), which gauges business activity in Indian factories but not its utilities, fell to 51.3 in March after surging to a one-year high of 52.5 in February. >> Indian companies mopped up Rs 71,370 crore through the markets during the financial year that ended March 31 - a 13 per cent rise from Rs 63,056 crore in 2012/13, according to a report by Prime Database. The funds were raised through various routes, including initial public offer, institutional placement programme and bonds. >> Climate change will result in extreme stress on drinking water resources in India and most of Asia, according to a report by the Intergovernmental Panel on Climate Change. The production of crops such as wheat, rice and maize, which are grown in tropical and temperate regions, will suffer if no adaptation measures are taken, the report noted. >> India's online retail industry reached $12.6 billion (Rs 62,967 crore) last year, an annual increase of 32.63 per cent. In 2012, it was $9.5 billion (Rs 47,349 crore). The Internet and Mobile Association of India expects further growth as policy and FDI issues are addressed. 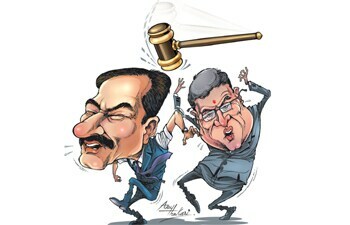 >> Noel Naval Tata has taken over as the chairman of Trent, the retail arm of the Tata Group. He succeeds F.K. Kavarana, who has retired. Noel Tata is the son-in-law of Pallonji Mistry, the single largest shareholder in Tata Sons and brother-in-law of Tata Group chairman Cyrus Mistry. >> Vedanta group company Sesa Sterlite has revamped its board, designating Nonexecutive Chairman, Anil Agarwal, as Chairman Emeritus. It has given him the role of of Chief Mentor. His brother, Executive Vice Chairman Navin Agarwal, will take over as Chairman, while the former head of Rio Tinto, Tom Albanese, is CEO. >> SpiceJet looked set to start a fare war by announcing base fares starting at Rs 1. The Directorate General of Civil Aviation asked the airline to scrap the scheme, but it continued until midnight on April 3. It was valid for travel between July 1, 2014, and March 28, 2015, on domestic flights. >> India's infrastructure sector output rose 4.5 per cent year-onyear in February, driven by higher electricity, oil refining and steel output. The sector grew 1.6 per cent year-on-year in January. In the first 11 months of the 2013/14 financial year, the output grew 2.6 per cent a year. The infrastructure sector, which includes coal, crude oil, oil refining, natural gas, steel, cement, electricity and fertilisers, accounts for 37.9 per cent of India's industrial output. >> While Samsung and Apple slug it out over patents in the courts, take a look at what their chiefs are raking in. J.K. Shin, the head of Samsung Electronics Co's mobile business, received $5.8 million in compensation last year. By comparison, Apple CEO Tim Cook received $4.25 million in 2013, little changed from the previous year, when he got compensation of $4.17 million. >> The Supreme Court has asked Samsung Electronics Chairman Lee Kun-Hee, South Korea's richest man, to surrender before a trial court in Uttar Pradesh in connection with a $1.4-million cheating case. He has been directed to appear within six weeks before a Ghaziabad court and seek bail and exemption from appearance. >> US ambassador to India Nancy Powell has resigned from the post. Powell recently established contact with the BJP's prime ministerial candidate, Narendra Modi, much after other envoys ended their boycott of the Gujarat Chief Minister following the 2002 riots. >> The Asian Development Bank predicts that growth in developing Asia will edge higher thanks to the recovery in rich countries, even as China slows. The region's 45 developing or newly industrialised economies will expand 6.4 per cent in 2015 after growing 6.2 per cent this year. The judiciary has risen steadily in importance the last few years. But nothing like last fornight. The Supreme Court's strike against BCCI chief N. Srinivasan was damning. "His staying on is nauseating for cricket," the court said, and brought in Sunil Gavaskar to calm things down. And the amount it asked Sahara to submit for its Managing Worker Subrata Roy's bail - Rs 10,000 crore - will take some beating. Last heard, the group was trying to raise half that amount from its employees. This will test the parivar like never before. The country's finances are at the core of this election campaign, but those who have been minding them are not. Four of the five men who have been finance ministers since the onset of liberalisation in 1991 are not contesting. Manmohan Singh retires after his term as Prime Minister ends in May. P. Chidambaram has ceded his constituency Sivaganga to son Karti, and Yashwant Sinha has bequeathed Hazaribagh to son Jayant. Pranab Mukherjee is now President, and above the fray. Only Jaswant Singh is in the mix, but his party, the BJP, denied him the Barmer ticket. So he is contesting as an independent. 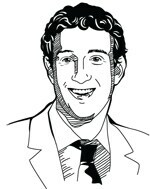 Facebook CEO Mark Zuckerberg has no more stock options to sell in his company. He reaped a $3.3 billion gain last year by exercising stock options in the social networking company that he founded in a Harvard University dorm room. Chandra Shekhar Ghosh started Bandhan Financial Services just 12 years ago in Howrah district by lending to destitute women. On April 2, Bandhan became one of only two entities, the other being IDFC, to secure a banking licence. Several bigger names were in the fray. >> Rs 8.6 lakh cr: Asset base of the mutual fund industry in FY13/14. HDFC MF (Rs 1.13 lakh cr) and ICICI Pru MF (Rs 1 lakh cr) are at the top.